3/27/2019 (Nashville, Tenn.) – Tennessee dairy advocate, Karman Meyer, appeared on Channel 4’s Today in Nashville segment to discuss The Dairy Alliance’s Diet Disasters campaign. Many current diet trends encourage cutting out various food groups, including dairy. Meyer explained the importance of including real dairy in every meal for bone and heart health, as well as chocolate milk’s powerful benefits as a performance beverage after exercise. To close out the show, Meyer demonstrated The Dairy Alliance’s sheet pan Mediterranean shrimp recipe and talked about the benefits of substituting yogurt for other ingredients in recipes. Viewers were directed to The Dairy Alliance’s website to learn more about dairy nutrition and healthy recipes. Watch Meyer’s full segment here. 3/7/2019 (Winchester, Tenn.) – Clark Memorial Elementary School in Franklin County held a Fuel Up To Play 60 kick-off event with over 600 students participating! The Dairy Alliance provided nutrition education to all of the students and staff. After learning all about dairy, students took a pledge to consume more dairy products every day. “The Cow Loves Cookies” was read to all of the students with Ms. Patty the Cow mascot making a special visit. To conclude the celebration, The Dairy Alliance presented the Fuel Up To Play 60 Grant check for $4,000! The students ended the event by chanting loudly, “WE LOVE DAIRY” over and over. 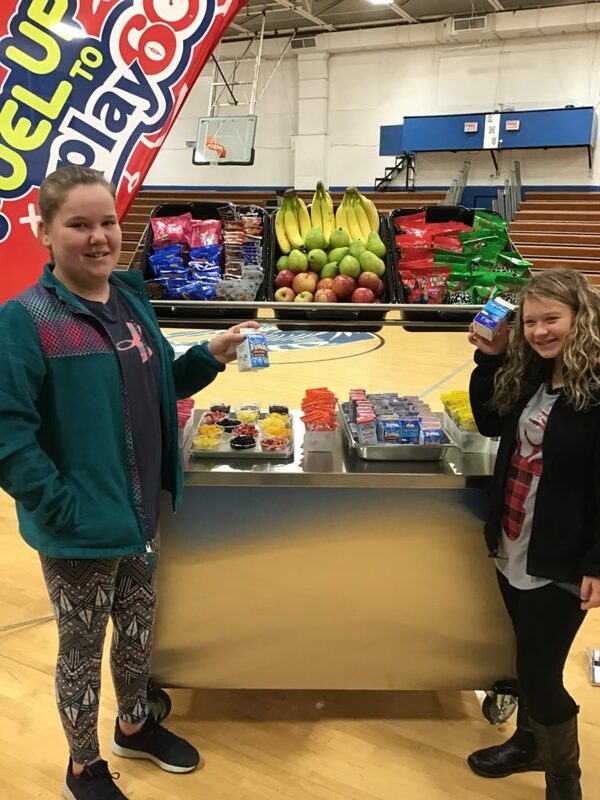 After the Fuel Up to Play 60 celebration, students were served yogurt parfaits at lunch and a Grab N Go option featuring a variety of dairy products. The serving line featured the grant-funded cold storage unit that held the parfaits. The students and staff are excited to have the new dairy additions as a permanent menu option! 2/28/2019 (Crossville, Tenn.) – The Dairy Alliance provided training to the school nutrition staff at Cumberland County High School in Crossville on how to use their new immersion blender. Cumberland County High was eager to start their new smoothie program after receiving a grant for the program and blender. To practice, the staff made over 600 smoothies that each included milk and yogurt. The students and faculty were able to sample the different flavors and give feedback about their favorites. Many of the students told The Dairy Alliance staff they love the smoothies and can’t wait for them to be a permanent menu item for the afterschool snack program. Athletic teams at Cumberland County High will be offered dairy smoothies after school to help with workout recovery. 1/28/2019 (Warren County, Tenn.) – The Dairy Alliance granted each of the ten schools in Warren County an Immersion blender kit to increase participation in school meals. School nutrition staff from each school were trained on how to best utilize the blender and prepare new recipes. The entire district revamped their lunch and dinner menus to include the new yogurt smoothies as a grab’n’go option. As a result, Warren County Schools saw an overall increase in dairy consumption. They moved an additional 508,872 more ounces of milk and 308,092 more ounces of yogurt. 1/28/2019 (Lebanon, Tenn.) – The Dairy Alliance teamed up with Cracker Barrel to feature a limited-time ice cream for the holiday season. Cracker Barrel featured the salted caramel ice cream at all 653 locations nationwide from November 1 to December 24, 2018. During that time, 12,000 gallons of salted caramel ice cream were sold which equates to 17,280 pounds of milk in just under two months. 12/5/2018 (Rutledge, Tenn.) – Rutledge Middle School Celebrate their $4,000 Fuel Up To Play 60 grant award with a nutrition training, check presentation, and pep rally. The Dairy Alliance conducted a brief dairy-nutrition training for the students at Rutledge Middle School. Principal Jones and the physical education teacher annouced the grant funding would go towards new badminton and frisbee golf kits along with equipment to store more dairy products. The director of school nutrition, Amy Orr, displayed the new parfait cart featuring fruit and yogurt parfaits. Students were asked dairy-themed questions and received Fuel Up To Play 60 towels, and frisbees for correct answers. All the students received promotional bracelets from The Dairy Alliance. The parfait self-serve bar will be offered to all of the students beginning in January. The students were encouraged to join to the Fuel Up to Play 60 site. The computer technology teacher is incorporating the Fuel Up to Play 60 site into the student class work. 11/14/2018 (Knoxville, Tenn.) –The Dairy Alliance hosted the first ever Dairy Academy at Sysco’s Knoxville location. The session included school nutrition directors and staff from 15 surrounding school districts interested in adding more dairy to the school menus. 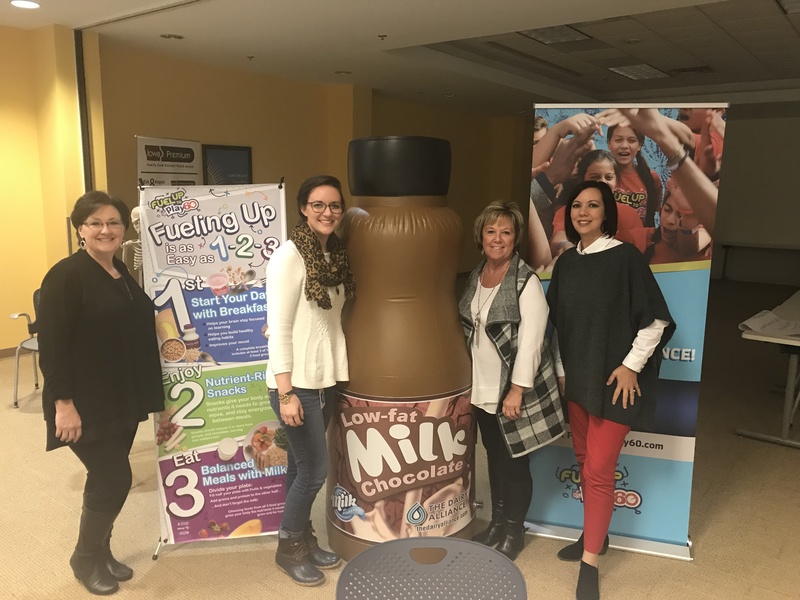 Attendees learned about the nutritional benefits dairy provides for children including chocolate milk as a sports recovery drink and lactose intolerance options. Amber Buckner from Wilson County along with Peggy Hamby from Morgan County presented the best practices and recipes to use when promoting dairy in schools. To celebrate the success of the first Dairy Academy session, attendees sampled dairy smoothies, yogurt parfaits, dairy-based salad dressing and yogurt bars. Lastly, The Dairy Alliance presented the National Dairy Council’s breakfast and lunch recipes and discussed available resources. Due to the success of the Dairy Academy pilot program, The Dairy Alliance will continue to educate school nutrition staff on how to include more dairy on school menus using Dairy Academy sessions throughout the region. 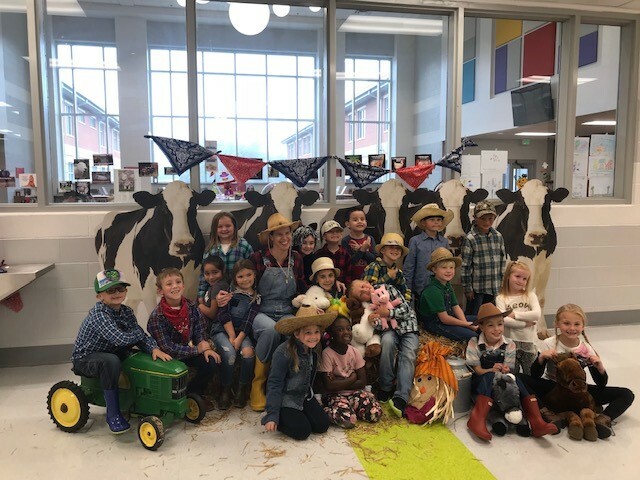 10/30/2018 (Hixson, Tenn.) – Middle Valley Elementary School in Hamilton County, Tennessee celebrated Farm to School Month by transforming the school into a farm. Over 850 students and staff dressed up as different farm animals. The school also celebrated receiving a Fuel Up To Play 60 grant. The grant fund will fund breakfast carts and stationary bikes for a spin class. Students and staff were able to sample strawberry smoothies. Since partnering with The Dairy Alliance, Middle Valley Elementary has received four Dairy Optimization Grants and three Fuel Up To Play 60 Grants. The Dairy Alliance passed out giveaways and door prizes to students. Students and staff were excited about the new dairy options on the breakfast menu. 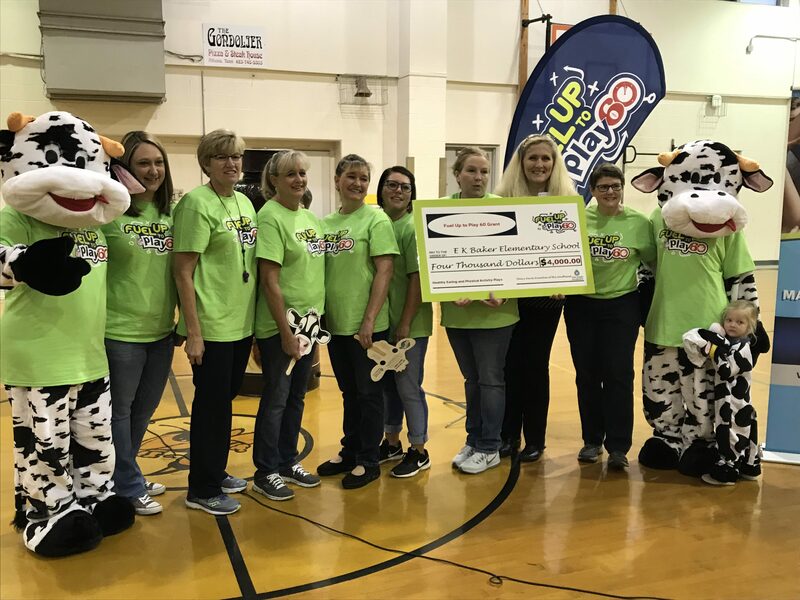 10/25/2018 (Athens, Tenn.) – E. K. Baker Elementary School in McMinn County celebrated their recently awarded $4,000 Fuel Up To Play 60 Grant to promote breakfast. The Fuel Up to Play 60 kick off started in the gymnasium with all the students participating in a Dairy Pep Rally. The Dairy Alliance presented an interactive dairy nutrition training where students received prizes provided for answering nutrition questions. The cafeteria manager also announced the new parfait menus to the students! The school nutrition director explained the Fuel Up to Play 60 program and encouraged students to visit the website. The school nutrition program donated “The Cow Loves Cookies” book to the library. After the pep rally, the pre-kindergarten and kindergarten students listened to a book read by The Dairy Alliance. Students also were provided a second chance breakfast which utilized the grant-funded yogurt parfait cart. Students could choose from a strawberry shortcake or peach cobbler parfaits.